Throw pillows are one of the quickest and easiest ways to change up your home decor and show your personal style. 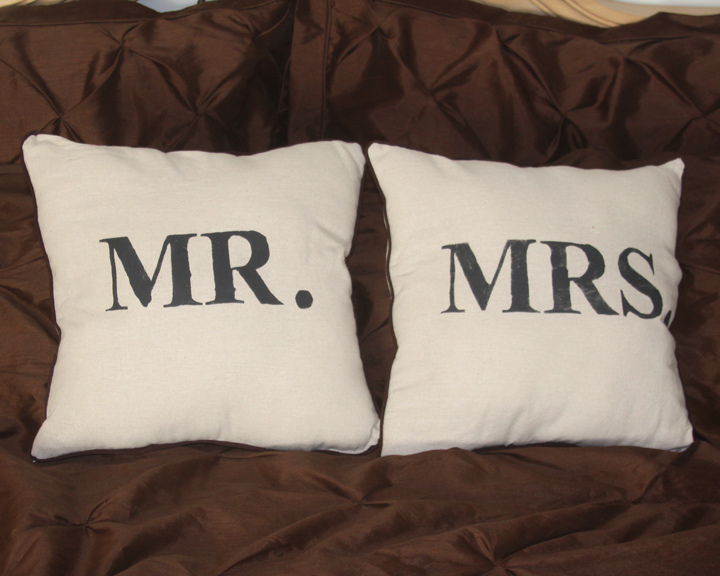 These Mr. and Mrs. pillows are an adorable DIY project that you can make for yourself or as a gift. What a cute and quirky way to claim your side of the bed or your favorite spot on the couch. I am forever swooning over all of the things in the Ballard design catalogs. Too bad I most likely will never be able to afford any of it. 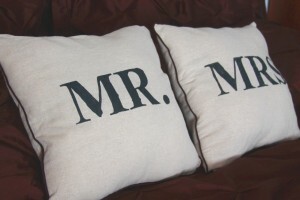 When I spotted their adorable Mr. and Mrs. Pillows I was head over heels. Burlap covered and distressed edging with the Mr. and Mrs. letters imperfectly displayed on the front. 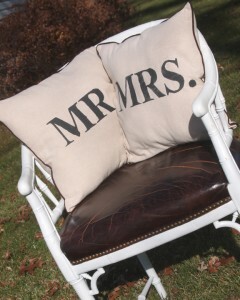 Wouldn’t these make the most amazing wedding gift, or Christmas gift for newlywed friends? When I looked at the price I just about fell over. $59.00…each! Yikes! Just think of what you can do with that $120.00. I set out to create my own version of their burlap pillows on the cheap. I found a natural warm colored fabric at our local fabric store. It wasn’t burlap, but I didn’t think burlap would really be the best choice for a throw pillow that I would be keeping on our bed. I also picked up some brown trim to sew into the pillow so the pillows would have a pretty little brown edging. I cut my fabric pieces the size that I wanted them and was ready to add my lettering. I first printed out a font that I liked with my Mr. and Mrs. logos on an 8 by 10 piece of paper. I laid some contact paper over the letters and traced around the outside of them. I then cut out the letters with an exact o knife from the contact paper to create a stencil to put onto my fabric. I peeled of the backing and stuck it to my cut out square of fabric that would be the front of my pillow. This would be very quick and easy if you have a Cricut or Silhouette machine. 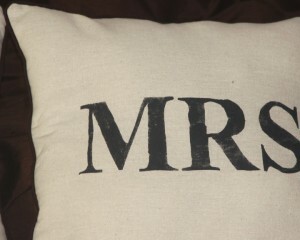 I used black fabric paint to put my letters onto the pillows. I wanted it to look distressed, and not perfect at all, so I used a little circular sponge brush to blot the paint on. I slowly blotted until the letters had the worn look that I wanted. After my letters were dry I was ready to sew my pillow together with the brown edging sewed in between the two layers. I stuffed them to my liking and then hand sewed the last little spot on the pillow. I was able to create these pillows for under $10.00! Now, that is a great way to give a personalized wedding gift to a friend that anyone can afford. Make them for yourself or give them as a gift – heck, at less than $5.00 per pillow make them for both! I have another longer pillow in the works that matches these with our wedding anniversary date on it. Can’t wait to show you just as soon as I get it finished.